Posted on Thu, Jan 31, 2013 : 5:09 a.m. 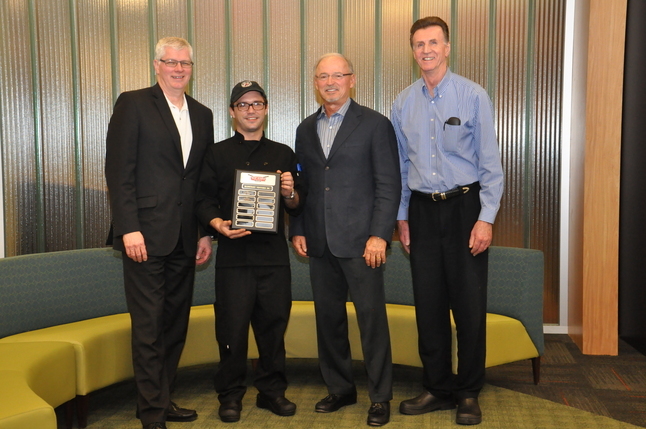 The overall 2013 Mainstreet Ventures Top Knife winner was Gabriel Alvarez from the Real Seafood Co. in Ann Arbor. The competition took place Jan. 8 at Washtenaw Community College in the Culinary Arts Department. Gabriel Alvarez (second from left) of the Real Seafood Co. in AnnArbor was the winner of a Mainstreet Ventures Top Knife Competition. He is pictured with representatives from Mainstreet Ventures, the parent company of Real Seafood. 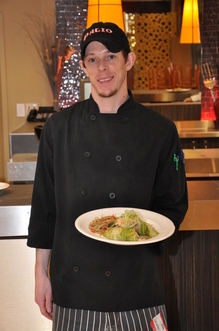 James Hanaway of Palio in Ann Arbor was recognized for his Wasabi Salmon creation. Alvarez’s winning entree was Grilled Swordfish with Golden Raisin Sauce. Ann Arbor chefs were also recognized as winners in several special categories: Alvarez in the Seafood category; Raul Flores of Carson’s American Bistro in Ann Arbor in the Most Original category for his Country Ribs with Ancho Chile Sauce; and James Hanaway of Palio in Ann Arbor in the Most Likely to be Featured as an Entree on MSV Specials Menus category for his Wasabi Salmon. The Top Knife Competition is a live cook-off competition between the qualifying 16 different MSV restaurants, showcasing uniquely styled dishes, with judging based on taste, plating and presentation. Competitors earned their spots to be at the competition by first competing against their peers at their own local restaurant with their entree. Sign up for the weekly Business Review email newsletter here.